A new Community Paramedic Program launched by the Leeds Grenville Paramedic Service, in partnership with Kemptville District Hospital (KDH) and the Champlain Local Health Integration Network (LHIN), is helping seniors and other people with complex health issues get the care they need. Through the program, specially trained paramedics make scheduled house calls to people who have been identified as needing at-home checks following ER visits or hospitalization. They provide non-emergency care such as help with medications, wellness checks, and safe home assessments. Additionally, an important part of the program is connecting people to other community supports to bridge any gaps in services. People referred to the program include seniors, people with chronic illnesses, mental health concerns, and disabilities. Community paramedic programs are proven to help people live independently longer, and reduce avoidable ER visits and hospital admissions. Deb Mitchell, KDH’s Team Lead for the ER, gave an example of how an at-home visit from a paramedic can be a game-changer. “By observing the patient in his or her home, the paramedic may identify a tripping hazard or other mobility or medical issue that we couldn’t possibly be aware of in the ER. This could definitely prevent a trip to the hospital,” she said. Community paramedic programs were first funded in Ontario in 2014, as part of the Ontario Ministry of Health and Long-Term Care’s Patients First Action Plan. In 2016, the Ministry committed to extending the program and working with partners to develop a long-term plan for community paramedicine. For KDH, community paramedicine is strongly aligned to the hospital’s strategic plan, which has an emphasis on building and facilitating partnerships with other providers and making care seamless for patients and their families. For the paramedics, the work is very rewarding, as it enables them to use skills outside their traditional roles as first responders. 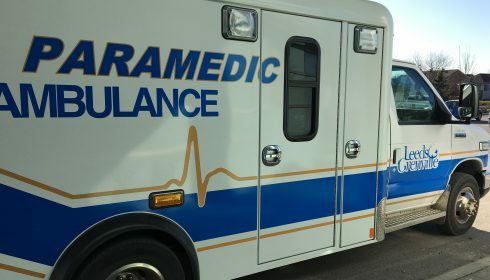 Jeff Carss, Deputy Chief of the Leeds Grenville Paramedic Service, described the paramedics as being, “the eyes and ears of the health system”. “They can see where there is need for additional support, and help connect patients to the services they need,” he added. Carss relayed that the Chief of the Leeds Grenville Paramedic Service, Chris Lloyd, received an email from Brian Campbell, a client of the community paramedic program, which spoke of its impact. In sending the email, Campbell copied Prime Minister Justin Trudeau, Premier Kathleen Wynne, Leeds-Grenville MP Gord Brown and MPP Steve Clark, North Grenville Mayor David Gordon, and KDH CEO Frank Vassallo. Since the community paramedic program was launched at KDH in July 2017, patients from the North Grenville community have received regular visits from Leeds Grenville Community Paramedics. KDH and Leeds Grenville Paramedic Service are looking to expand the program. Currently patients are referred to the program by KDH nursing management following an ER visit or hospital admission. Kemptville District Hospital is Accredited with Exemplary Standing, the highest ranking bestowed by Accreditation Canada. Committed to building healthier communities, we are a model of hospital-led integrated health services within the provincial health system. Kemptville District Hospital consistently ranks among the top hospitals in Ontario for both patient and employee satisfaction. We pride ourselves on being a good partner within the system. Kemptville District Hospital provides acute care hospital services, advanced orthopedic care, and primary care management services.